Some of the top riders on the World Cup cross-country circuit extended their season a few weeks to attend the Guiyang International Mountain Bike Invitational in Guiyang, China. Fabian Giger (Rabobank Giant) won the men's event, while Blaza Klemencic (Slovenian National Team) took the women's title. Guiyang, a city of nearly five million, located 1800 kilometres southwest of Beijing, is one of the major tourist regions in China, due to its temperate climate and many natural attractions. 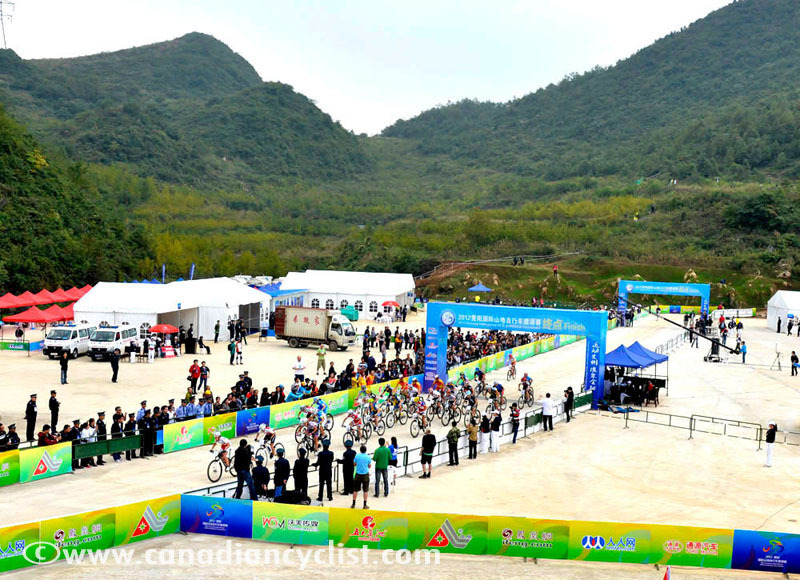 The city hopes to add mountain biking as a destination activity, and the Guiyang Invitational is a test event for a potential World Cup here next season (Cross-country and Eliminator). The 4.1 kilometre course was built amid rolling, wooded hills on the outskirts of the city. While not extremely technical, it does offer considerable climbing and a few tricky descents. Overall, there was strong feedback from the riders that this course is suitable as a World Cup circuit. Designed as a series of loops radiating out from the start-finish area, it offers excellent spectator viewing, with fans able to criss-cross the course to see the riders multiple times, as well as watch them climb up and down the sides of the valley from the center of the venue. The women's five lap race quickly came down to three riders - Klemenicic, Eva Lechner (Colnago) and Sarah Koba (JB Felt). Under 23 world champion Yolanda Neff (Swiss National Team) rode with the leaders for the first lap, but began to struggle on the second and faded to finish tenth. Lechner, who had won a demonstration Short Track race the day before, attacked on the fourth lap, opening a ten second gap on Klemencic as she entered the last lap. However, the Slovenian national champion battled back to catch and drop Lechner on the climbs and win by 22 seconds. Koba took third at 1:09. The men's race followed a similar pattern, with three riders opening a gap on the rest of the field on the first of seven laps. Giger was joined at the front by Swiss compatriot Martin Gujan (Swiss National Team) and Maxime Marotte (BH-SR Suntour), and the three quickly pulled away from Emil Lindgren (Rabobank Giant), who managed to hold on for fourth at the finish. The three rode cooperatively for the first half of the race until Giger decided to go it alone on lap four. Gujan dropped Marotte almost immediately in a solo chase. It looked like Giger was going to easily take the victory, but he backed off on the descents late in lap five, allowing Gujan to pull within ten seconds as they started the sixth lap. Digging deep, the number-five world ranked rider re-established his lead by the start of the final lap and extended it to finish 56 seconds ahead of Gujan, with Marotte taking third at 1:20. 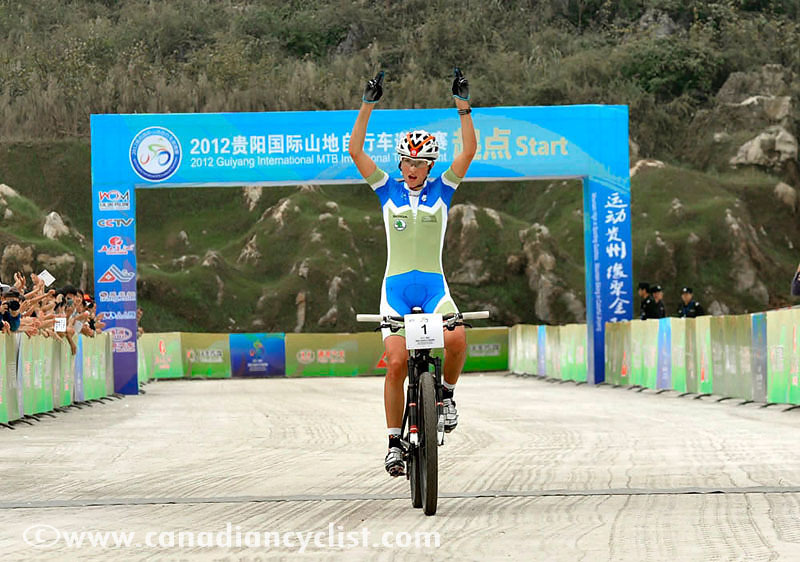 - While the UCI and the Guiyang organizers still have to work out details and sign a contract, it appears that Guiyang has a strong chance of opening the World Cup Cross-country and Eliminator season for 2013, likely in late April or early May. This will take the series back up to six events. - In the past few months, the organizers have literally built a venue from scratch. 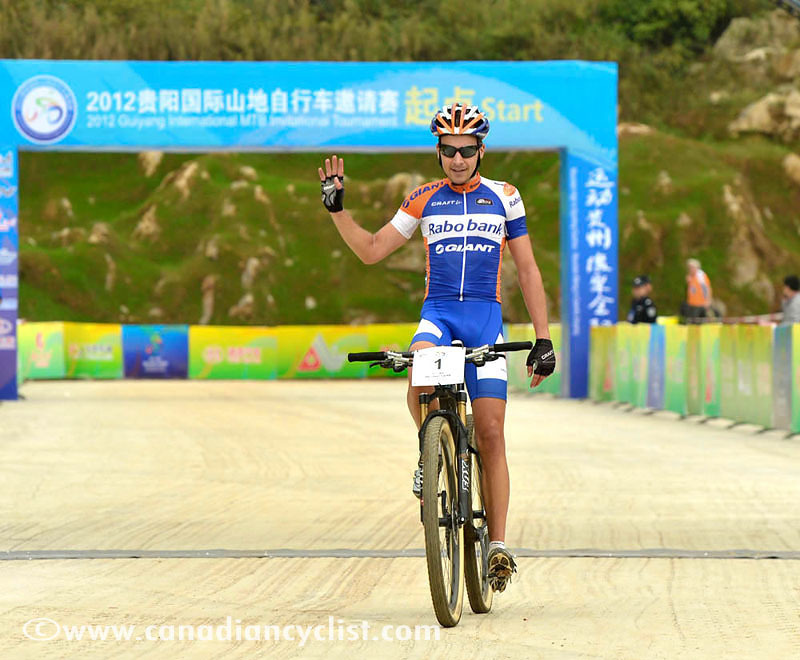 In addition to creating the trails, they also constructed paved roads and parking in the venue, brought in electrical services, and poured a concrete base big enough for the finish area, teams area, media centre and stands. - The opening ceremonies left everyone gasping. Broadcast live on television for the region, it resembled a mini-Olympic opening ceremony, with performances, fireworks and a team presentation. It was rumoured to have cost into seven figures. - Not racing, but present, was a familiar face: former World Cup winner Ren Chengyuan. Ren said that she is coming back from a knee injury and plans to be able to compete by next season. - We have interviews wit the winners, but connection to YouTube is not allowed in China, so they will be posted on Sunday when the editor is back in Canada.